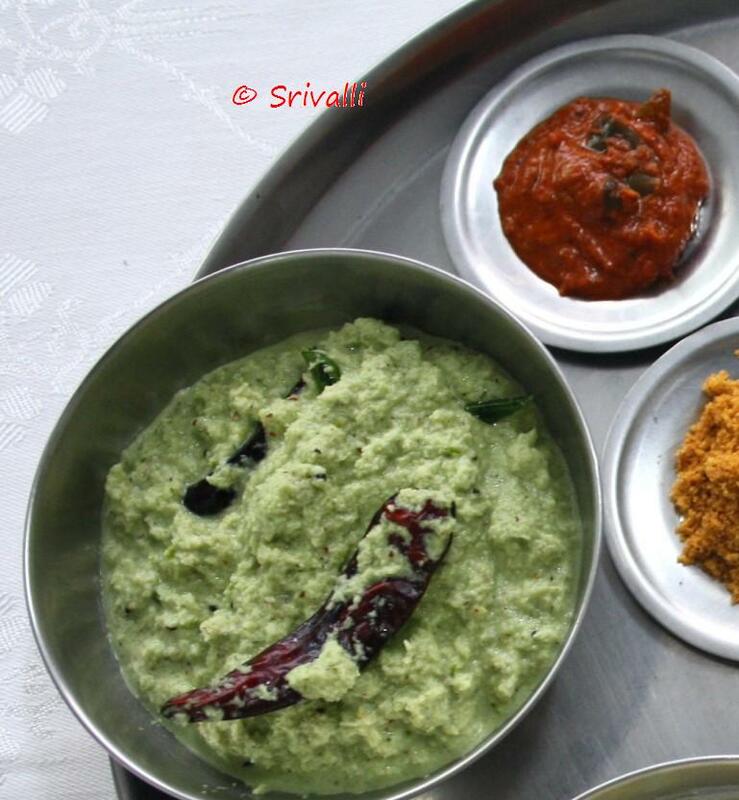 Chutneys or Pachadis are indispensable part of a breakfast, atleast in most South Indian families. I have always known Amma making either Peanut Chutney or Coconut Chutney every day of the week. Only later when we grew up that she ever tried other chutney varieties with tomatoes, onions etc. We love groundnut chutney/ Peanut chutney with anything or everything. Apart from this was the Coconut Chutney that was prepared frequently, because my brother liked only this. So Amma ended up prep it up with other interesting ingredients to bring variations to this. One such ingredient was adding fresh coriander to the coconut chutney. Fresh Coirander adds such flavour the regular Coconut Chutney, plus this is a nice way to include the coriander in your diet. Wash the coriander leaves and put it in a colander to get the water drain. Remove to a bowl, heat a pan with oil, add the mustards and urad. When it starts spluttering add the curry leaves and immediately pour over the ground chutney. My favorite of all chutneys!Needless to say the goodness of coriander. My all time fav. My sis used to make the same kind of chutney. Love yours. Looking yummy!!!! Mmmmmm… naku chala istam.. looks sooooooo tempting dear… thanks for sharing!! looks so good! love the color and aroma of this chutney. Cilantro looks yum, my fave with any dosa or chapatis too. Hope your diet is going well. I haven't kept in touch with your routine after I came back for break. Amna, We don't normally pack coconut chutneys in boxes during summer. However if you are in a ac room and you have added tamarind, it stays good for nearly 3 – 4 hrs. Amna The red chutney that you see next to this will stay for a day at room temp, two days when refrigerated. Check out for the other roasted chutneys in the Index> Will make a post of it soon. I am sorry but i dont recognise that chutney.what chutney is that ?